A luxury cruise ship hit by a virus which led to "a holiday from hell" for many Britons has set sail again after having been disinfected. The Sea Princess docked in Southampton a day early on Friday, missing out the intended destination of Lisbon, after 200 passengers caught a vomiting bug. Many of them were disappointed after having been stuck in their cabins for much of the seven-day European tour. The ship set off on her next cruise on Saturday afternoon. A spokeswoman for Princess Cruises parent company Carnival UK said passengers had been told to stay in their cabins to avoid further spread of the illness. She added: "We brought the ship in 24 hours early so we could sanitise the ship and eradicate the illness to stop the spread to future passengers." The company admitted there had been a smaller outbreak on the last two days of the boat's previous cruise, but it does not believe the two outbreaks are linked. A 30% refund and a £150 per person voucher towards a future cruise has been offered to the 2,258 passengers on the ill-fated seven-day trip. 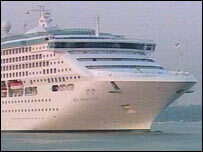 But passengers leaving the ship on Friday reacted angrily to the offer, calling for a full refund. Philip Wilson, 50, from Radstock, near Bath, who was on board with his wife Suzanne, 44, and two children, said: "It was a holiday from hell. That's not even describing it. It was worse than that." The virus is suspected to be the Norovirus, which is a common cause of stomach bugs and lasts 48 hours.